Although we are in Brittany and I don’t believe fries are the traditional Breton accompaniment for mussels, it seems this famous Belgian pairing has anchored itself so steadfastly in our subconscious that anytime I (we) think of mussels, I (we) think fries. So when we prepared mussels the other day, the other half of the meal seemed obvious. It was the first time I made really good home-baked fries and I think it was thanks to a tip from my sister who suggested starting them low and slow so they would cook through without burning or drying out. Cut the potatoes in half lengthways, place each half cut side down, and slice into 1/2 inch (1 cm) pieces. Wash the potato pieces in cold water and pat thoroughly dry with a (clean) kitchen towel. 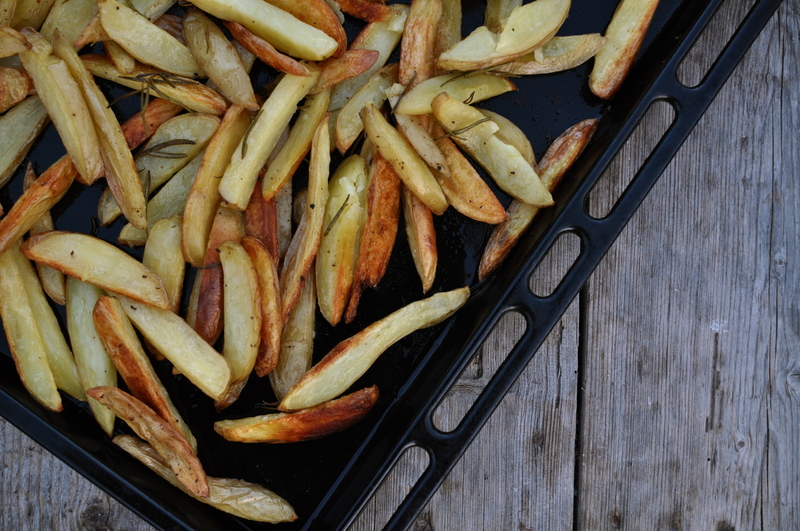 Place the potatoes on a large shallow oven pan. Drizzle generously with olive oil, season with salt, pepper, and sprigs of rosemary. Toss so all the pieces of potato are dressed with the olive oil. Put in the low oven and cook for about 20 to 25 minutes. 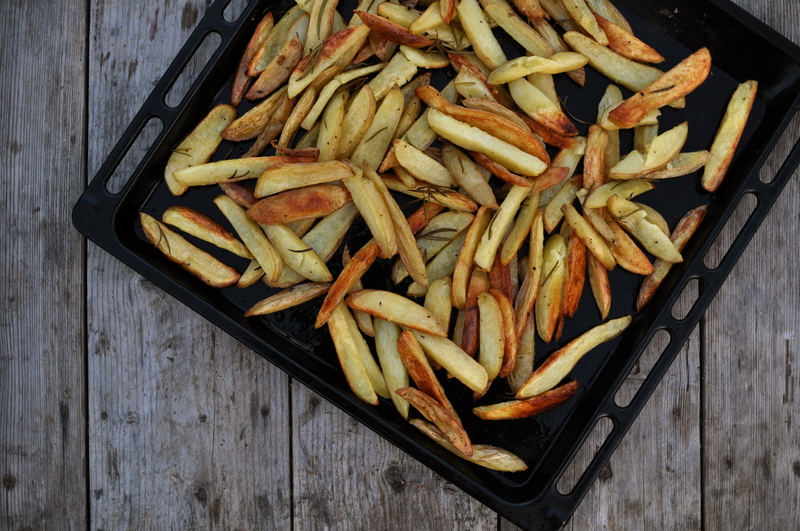 When the potatoes seem cooked through, increase the oven temperature to 425F (220C) and bake for another 10 to 15 minutes until gold and crisp. Check for salt seasoning, adjust, and serve hot. This entry was posted on 8 August 2011 at 18:28 and is filed under Children, Easy, Fall, Spring, Summer, Winter, Year-round. You can follow any responses to this entry through the RSS 2.0 feed. You can skip to the end and leave a response. Pinging is currently not allowed. I love baked fries! They’re so much healthier. Although, instead of turning up the heat, I broil them to get them browned and crunchy. Just made some this afternoon for my sis-in-law and her kids.